Micro flash memory card device damaged files retrieval utility helps in restoration of inaccessible, corrupted sd xd mmc memory card files folders picture images. 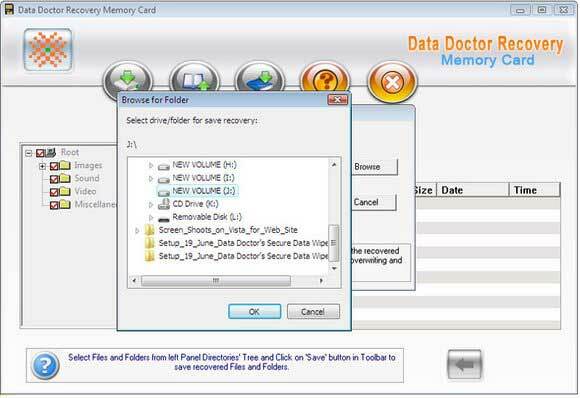 Multimedia memory card deleted data restoration application support prevention of songs 3gp mp3, avi, wav, audio video music files from all type of storage card device. Data rescue software can retrieve and repair all damaged, formatted clips photos like jpeg jpg png bmp gif tiff and riff from compact flash, sd, xd memory card. Application provides whole data retrieval solution or recovers deleted backup files directories and supports all formats of images audio video and pictures. Tool retrieve formatted compact flash card of digital camera and mobile phones. Software provides inbuilt step by step recovery help manuals. Secure xd sd flash memory card data retrieval program is non-destructive and read only utility. Application tool is compatible with all windows operating system such as windows 98, xp, me, nt, 2000, server 2003, xp media center 2005 and windows vista. Digital Flash Card Restore is an utility that works under windows xp, windows vista, . Estimated download time for Digital Flash Card Restore on a common adsl connection is less than a minute. Version 3.0.1.5 was released four thousand two hundred seventy three days ago by Files Recovery. Click the green download button to download it now.